So that show Lie to Me is pretty sweet. I read about the guy it is based on, Paul Ekman, in a few books and decided to investigate a little more. 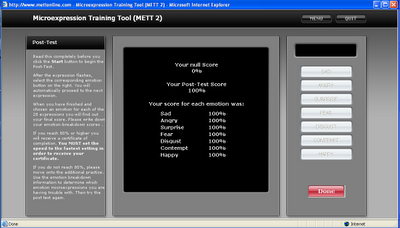 I found this training tool that tests your ability to recognize micro expressions. (These are involuntary expressions that last less than 1/15 of a second, as short as 1/25 of a second). Here is a WIRED article about the subject titled 'What a Half-Smile Really Means' Pretty cool stuff. 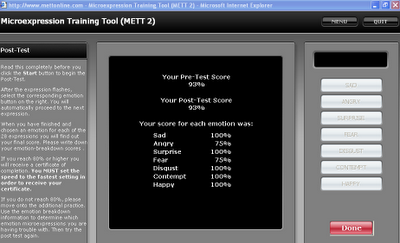 Btw I totally scored a 100% when I took the test har har har. Pre-test (before training) was 93%. Feel the power! Wu-Tang! If you are at all interested in this stuff, you should check it out, although beware, once you are good at telling if people are lying, you can't turn it off. Here is a link to a FREE version of this sort of test, but this one is only composed of 10 faces. See how you do. The METT test is 28 of these faces (random every time across different gender/cultural faces) at what looks like a slightly faster face morph, although this is pretty close to the fastest speed on the METT test. After the METT training I ripped through these 10/10. Apparently not everyone will be good at this though, there is a limit to visual capture time for some people and some people have better natural instincts for processing this information at a subliminal level. It's fun though and you can learn a few things that may be useful.